Apr 09 Alpine: High. Treeline: High. Below Treeline: Considerable. Apr 09 Alpine: High. Treeline: Considerable. Below Treeline: Considerable. Apr 10 Alpine: High. Treeline: Considerable. Below Treeline: Considerable. Apr 11 Alpine: Considerable. Treeline: Considerable. Below Treeline: Considerable. Apr 12 Alpine: Considerable. Treeline: Moderate. Below Treeline: Moderate. The Bottom Line: Large and dangerous wind slabs that formed above treeline Tuesday night and Wednesday continue to gradually stabilize. Continue caution on the upper mountain by avoiding steep wind-loaded terrain and by limiting your exposure to large open avalanche paths that begin higher on the mountain. Increasing potential for loose wet avalanches on steep southerly facing slopes will develop during the warmest part of the day. After an initial bout of snow, a strong frontal system pushed heavy rain up to at least 6500-7000 ft Tuesday night and Wednesday morning in the Mt. Hood area. Strong west winds also rocked the mountain. On Friday, we will continue to deal with two types of avalanche problems; hard wind slabs above the rain-line in the alpine and loose wet avalanche potential on steep southerly facing slopes. The high-amplitude upper-level ridge offshore pushes slightly further into the region with temperatures aloft warming further tonight into tomorrow, giving us the warmest temperatures we've experienced since November over our mountains by late Saturday into Sunday. Weak systems are spilling over the top of the ridge into SE Alaska and are dropping south through the Rocky Mountains, leaving our region largely unimpacted. Low-level moisture is generally decreasing, so clouds should be mostly clearing out on Saturday. Low-level inversions and fog or freezing fog are likely in some locations. Saturday will be the warmest day for our mountains since November 19th, with freezing levels pushing 11000 ft. On Sunday, a trough moving east along the Rockies will knock back temperatures slightly in our region, but it will remain unseasonably mild. The recent weather pattern of lower accumulation storms (by NW standards) and longer stretches of calm weather should continue as we move into late January. Since January 17th, incremental snow accumulations punctuated with rising freezing levels favored the south and eastern parts of the region. Storm instabilities have risen with storms and gradually subsided. A storm slab at Mt Baker. Storms over the past week have brought a range of layers from rain crusts, to heavy moist snow, to stiff drifts, to light dry powder. Some storm days, like the 18-19th, saw reactive, but very short-lived avalanches caused by heavy precipitation and wind. Even the longer-lasting avalanche problems, wind slabs, haven't persisted for more than a few days. Where the recent snow is stressing underlying weak layers, more dangerous avalanche conditions have prevailed. Persistent weak layers (PWLs) have been a constant in the eastern zones of the Cascades this winter. As usual, they have been much less problematic at the Passes and west of the Cascade Crest. 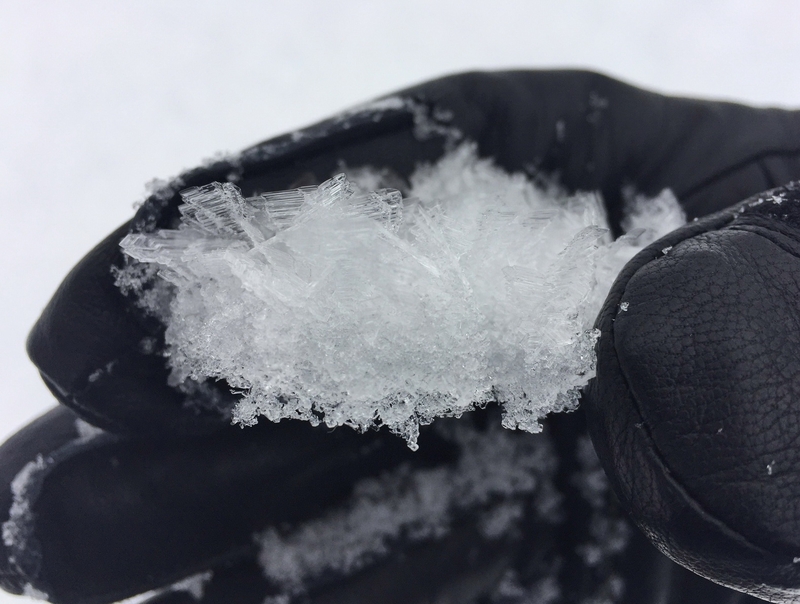 The latest PWL is a layer of surface hoar, buried around January 17th and found generally east of the Cascade Crest. Buried surface hoar is an active weak layer in the eastern zones and can be found to a limited extent on the eastern edge of the Stevens and Snoqualmie Pass zones. There few, if any, avalanches have been reported on the buried surface hoar. It may be most problematic in open, wind-sheltered terrain, especially well above the valley floor. You are most likely to find other layers of old weak snow the further you move east from the Cascade crest. Here snowpacks are shallower, more variable, and generally weaker. In some locations, weak snow near the ground can still be found. These basal facets have hung around all season. Digging profiles and using snowpack tests is the best way to gain information about these old persistent weak layers. However, snowpack tests are just one piece of the puzzle. Your terrain decisions shouldn't hinge on any given test result. Because of the size of our forecast zones and the variability in the snowpack, it's important to make snow observations as you travel. We’ll keep watching these old layers, but let us know what you see while you are in the mountains. Wind slabs are the dominant feature at higher elevations. Older, deeper winds slabs still linger from Wednesday’s storm. While they are gaining strength, you are most likely to trigger these larger slabs on very steep slopes, near convex rollovers, or just below cornices. Warming temperatures and sunshine will increase the odds for loose wet avalanches on Friday. These avalanches are most likely to release from steep, rocky, sunny slopes during the warmest part of the day. Monitor changes in the upper snowpack, looking for natural pinwheels or small loose wet avalanches as clear signs of increasing danger. Avoid terrain traps like gullies where even a small avalanche can bury you.